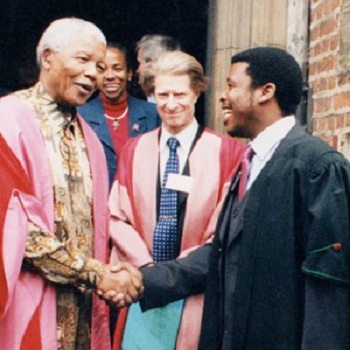 Mandela Magdalene College Scholarship for South Africa 2013 - The Mandela Magdalene College Scholarship were announced in March 1995 when Nelson Mandela, then President of The Republic of South Africa, agreed to lend his name to the initiative. On this letter of reputation Madiba wrote: "I approve using my title for the Scholarship to lend a hand South African students. Our usa is in dire need of skilled women and men to carrier our new democracy. We're deeply grateful that Magdalene College took the initiative to assist." The scheme effects from a collaboration among Mr Chris von Christierson and different benefactors, the Cambridge Trusts and Magdalene College, Cambridge. Up to 3 scholarships are offered each year. The scholarships enable graduates from South Africa to pursue one-year taught postgraduate courses of study at the University of Cambridge in subjects relevant to the needs of South Africa. The scheme aims to support South African graduate students of outstanding academic merit and leadership potential who would otherwise be unable to take up a place at Cambridge University. The scholarships are open to citizens of South Africa, normally under the age of 35 and normally resident in South Africa who have, or expect to obtain before 1 October 2013, a first class or high second class honours degree or its equivalent from a recognised University. Successful applicants will be expected to return to South Africa to work or study after completing the course at Cambridge. The scheme is administered on behalf of the University of Cambridge and Magdalene College by the Board of Graduate Studies (for admission to the University) and the Cambridge Trusts (for funding). Applicants for admission to the University must complete and return a GRADSAF application form to the Board of Graduate Studies; applications must be completed by 2 December 2012. Applications will first be assessed by the candidate's proposed Faculty or Department at the University. If successful, the candidate's application will be further reviewed by the Cambridge Trusts and Magdalene College. Short-listed candidates may then be asked to attend an interview in South Africa. The academic year 2013 - 2014 will commence in Cambridge on Tuesday, 8 October 2013.